During World War II , Lithuania was occupied by the Soviet Union (1940–1941), Nazi Germany (1941–1944), and the Soviet Union again in 1944. Resistance during this period took many forms. Significant parts of the resistance were formed by Polish and Soviet forces, some of which fought with Lithuanian collaborators. This article presents a summary of the organizations, persons and actions involved. In 1941, the Lithuanian Activist Front (Lithuanian : Lietuvos Aktyvistų Frontas) formed an underground government, and following the June uprising, the Provisional Government of Lithuania maintained sovereignty for a brief period. There was no significant violent resistance directed against the Nazis. Some Lithuanians, encouraged by Germany's vague promises of autonomy,  cooperated with the Nazis. Pre-war tensions over the Vilnius Region resulted in a low-level civil war between Poles and Lithuanians. Nazi-sponsored Lithuanian units, primarily the Lithuanian Secret Police,  were active in the region and assisted the Germans in repressing the Polish population. In the autumn of 1943, the Armia Krajowa began retaliatory operations against the Lithuanian units and killed hundreds of mostly Lithuanian policemen and other collaborators during the first half of 1944. The conflict culminated in the massacres of Polish and Lithuanian civilians in June 1944 in the Glitiškės (Glinciszki) and Dubingiai (Dubinki) villages. See also Polish-Lithuanian relations during World War II. In July 1944, as part of its Operation Tempest, the Polish Home Army launched Operation Ostra Brama, an attempt to recapture that city. See also Polish–Lithuanian relations during World War II . Lithuanian partisans, known as the Forest Brothers, began guerrilla warfare against the Soviet forces as soon as the front passed over them in 1944, and continued an armed struggle until 1953. The core of this movement was made up of soldiers from the Territorial Defense Force who had disbanded with their weapons and uniforms and members of the Lithuanian Freedom Army, established in 1941. The underground had extensive clandestine radio and press. Thousands of people engaged in active and passive resistance against the Soviet authorities. The various resistance organizations eventually united under the Movement of the Struggle for the Freedom of Lithuania (Lietuvos Laisvės Kovų Sąjūdis, or LLKS), issuing a declaration of independence in 1949 that would ultimately be signed into law by the independent Republic of Lithuania in 1999. The most famous of these partisans is probably Juozas Lukša, author of several books during the resistance and the subject of a recent film. ↑ "Chiune and Yukiko Sugihara". Jewish Virtual Library . Retrieved 2006-06-29. ↑ Janavičienė, Audronė (2004-01-30). "Soviet Saboteurs in Lithuania (1941-1944)". Genocide and Resistance Research Centre of Lithuania . Retrieved 2006-06-30. ↑ Piotrowski, Tadeusz (1998). Poland's Holocaust. McFarland & Company. p. 163. ISBN 0-7864-0371-3. 1 2 Snyder, Timothy (2003). 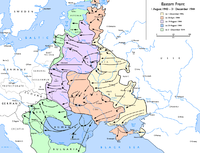 The Reconstruction of Nations: Poland, Ukraine, Lithuania, Belarus, 1569-1999. Yale University Press. p. 84. ISBN 0-300-10586-X. ↑ Banionis, Juozas (2004-03-10). "The Liberation of Lithuania in the West under détente, 1970–1974". Genocide and Resistance Research Centre of Lithuania . Retrieved 2006-06-29. ↑ Rosenberg, Jennifer. "Abba Kovner and Resistance in the Vilna Ghetto". About.com . Retrieved 2006-06-29. ↑ "Righteous Among the Nations - per Country & Ethnic Origin January 1, 2008". Yad Vashem . Retrieved 2009-02-04. ↑ Procuta, Genius. How Many Rescuers of Jews Were There?, Tėviškės Žiburiai , Missisauga, Ontario, Canada, 1999-03-16. ↑ Seimas of the Republic of Lithuania. Law on the February 16, 1949 Declaration by the Council of the Movement of the Struggle for Freedom of Lithuania, Law No. VIII-1021, 1999-01-12, Vilnius.